Las Vegas, April 11, 2018 – Interlogix, a global leader in security and life safety solutions, today launched new products to make home and commercial security more convenient and effective, including two 5-inch, full-color LCD secondary touch screen controllers for the Simon and Concord security systems. Interlogix also introduced a new photoelectric smoke detector with built-in heat and freeze sensors and a new Command Button for controlling home automation tasks. Interlogix is part of UTC Climate, Controls & Security, a unit of United Technologies Corp. (NYXE:UTX). The Simon full-color, LCD secondary touch screen is an ideal way to provide up to four additional points of system control throughout a home. The screens quickly and seamlessly connect to the Simon panel using the Interlogix wireless protocol. When installed with a Simon panel equipped with Alarm.com® services, the touch screens enable control of other functions including Z-Wave® wireless lights, thermostats, door locks and other appliances. The 5-inch touch screen provides status icons to identify open windows and doors, last motion detected and a “my property” icon that covers all other areas on the system. A built-in rechargeable battery provides backup power in case of an outage. The Concord 5-inch touch screen provides home and business owners with at-a-glance status information to easily and conveniently control their Concord system. The screen supports multi-partition control and system arming. Integrated speakers provide chime and siren sounds, notifying system owners of alarm conditions. Power is supplied and backed up by the panel battery. Multiple screens can be added, the total number dependent on power requirements of other system devices. The touch screen is compatible with Concord 4 security system versions 4.5 or later. The Interlogix SDX-135Z photoelectric smoke detector with heat and freeze sensors uses wireless connectivity to ensure when one unit senses smoke, all detectors on the network will go into alarm mode. The detectors can be used simultaneously as a smoke/heat detector and freeze sensor - which alerts users if surrounding area temperature drops below a certain point. They feature a 10-year sealed battery and continually monitored operational status, providing a visual notification of network or unit failure. The units are compatible with the Interlogix® Simon, NetworX, Concord and UltraSyncÒ alarm panels. The new Interlogix Command Button is a compact device that can be used to control individual Z-Wave devices and trigger multi-device automations. “Control of lights, locks and other devices using an Interlogix security panel has never been easier,” said Chiavacci. 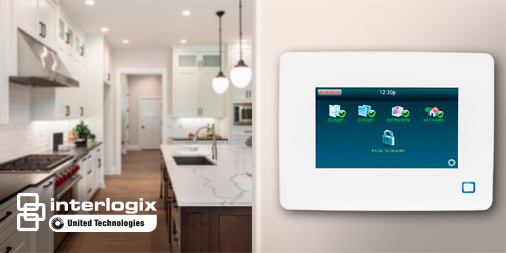 “Now with a single push, the compact and wireless Interlogix Command Button can trigger up to three different, simultaneous automations on the UltraSync system and other Interlogix panels paired with Alarm.com interactive services.” The button’s low-profile design makes it perfect for enhancing automation capability throughout homes and small businesses. The new touch screens, smoke detector and Command Button are available from Interlogix dealers throughout North America.